The adorable Ginger Pauley performing with Ginger & the Hoosier Daddys at The Cicada Club in Los Angeles. Photo courtesy Dave Welch of Photos With Class. 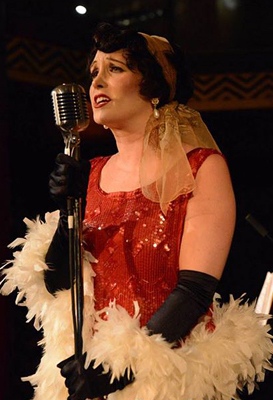 Ginger & the Hoosier Daddys in Facebook Multitalented Los Angeles entertainer Ginger Pauley has earned the nickname "The Vintage Girl" because of her authenticity and dedication to the Vintage mindset. She is best known in the acting world as a long-standing character and stock actress on The Conan O'Brien Show, and has also appeared as Mrs. Joyce Sherman in Saving Mr. Banks (2013). Ginger also fronts a 1920's-40's style jazz band called Ginger & the Hoosier Daddys (gotta love the name :-D ) that plays society events locally in the Los Angeles area. Ginger is an endearing and fun-to-watch frontlady, and the band is solid and great to dance to. They have one six-song EP so far, entitled That's Why I'm Happy (2012), that you can buy on iTunes or hear at Spotify. Like their Facebook page for updates and adorable photos of Ginger, The Vintage Girl herself! Onřdej Havelka and His Melody Makers are a Czech big band that do 1930’s and 1940’s-style big band music right; the atmosphere, the class, the excitement, and the energy are all here in no uncertain terms. Their frontman, Ondřej (pronounced like “Andre”) Havelka, plays ukulele and sports coke-bottle glasses and a fun-loving but still commanding personality. Although they are popular in Eastern Europe, and were even signed to the Czech division of EMI, their music is unfortunately rather tough to get in the Anglo-American world at the moment. With the growing popularity of Vintage Music, that may change before we know it. Honorary Bakersfield cowboys The Altar Billies. Left to right: Mike Stand, guitar; Chuck Cummings, drums; and Johnny X, upright bass. The Altar Billies on CDBaby The Altar Billies are rather unusual in that they are a Vintage reinvention of the new wave/rock band The Altar Boys, an Orange County, CA-based Christian rock group that was popular in the 1980’s. After many years of inactivity, frontman Mike Stand (best stage name ever!) began working with a bass player named Johnny X. Johnny X noticed that many of The Altar Boys’ songs work surprisingly well in a rockabilly context. With session musician Chuck Cummings added on drums, this trio has gone on to develop a hard-driving sound that fills a void somewhere between Reverend Horton Heat-style rockabilly and Johnny Cash-style gospel country. The music salutes the past, whilst maintaining a positive message and an infectiously jovial mindset. You can find The Altar Billies on Facebook, Twitter, Reverbnation, and YouTube. Snowboy and the Latin Section is a British Afro-Cuban jazz combo fronted by percussionist Mark “Snowboy” Cotgrove. The group is very established in the UK, with a long list of credits and albums to their name. Snowboy is also an in-demand session player, producer and radio programmer who works with current pop artist Lisa Stansfield and many others. Snowboy has an immense knowledge of black music from the 1960’s and 1970’s, and has written the book From Jazz Funk and Fusion to Acid Jazz, which is now on the required reading list at Yale University. Not to mention, he is the fellow who produced our sister compilaiton album Snowboy Presents New Vintage Vol. 1, which you can listen to on Spotify. He's a busy and well-rounded fellow to say the least! One of the tracks on Patricia Scot's only LP, Once Around the Clock (1959), featuring Kenyon Hopkins on arrangements and instrumental backing by The Creed Taylor Orchestra. Patricia Scot is a One Shot Wonder who had the lucky opportunity to record her lone LP, Once Around the Clock (1959), with The Creed Taylor Orchestra, with crime jazz maestro Kenyon Hopkins providing arangements. I'm a HUGE fan of Kenyon Hopkins (best known today for The Hustler soundtrack), and tend to think of him as Henry Mancini's shadow self; in fact I actually like Hopkins a little better than Mancini. I didn't realize until after I had bought and was regularly listening to Once Around the Clock that it was Mr. Hopkins' arrangements that were hiding behind the vocals of this lively and witty gal. Pat's website confirms her to be as much of a firecracker as the Once Around the Clock LP suggests her to be. The site features a whole bunch of pretty pictures of Pat and memorabilia from throughout her life, as well as a number of rare recordings that she has done outside of Once Around the Clock. It would be nice to see these recordings get mastered and anthologized on CD; they are quite good! Jill Corey If you ever want to read a fantastic Cinderella story from the early days of the recording industry, read the unlikely success story of One Shot Wonder Jill Corey. Jill was a coal miner's daughter from Pennsylvania who got to experience the overnight success story that people still dream of having happen to them. She was a singer on a local Pennsylvania radio show, and a fan encouraged her to send a tape of her singing to Columbia Records. In one day, Jill went from local radio singer to Columbia Records signee, Life magazine cover girl, and guest vocalist on the Aurthur Godfrey and His Friends television variety show. Jill did one LP, entitled Sometimes I'm Happy...Sometimes I'm Blue (1957), the latter of which the label gave her full control over. She also did a whopping twenty-eight non-LP single releases; Jasmine Records released a 2-CD anthology of every one of her 28 singles in 2015 (I flipped when that came out). Collectibles Records gave Sometimes I'm Happy...Sometimes I'm Blue a CD reissue back in 2003. Jill's website has a lot of lovely photos of her, and also chronicles her fantastic success story, which you can read on the bio page. Lucy Ann Polk sings "Darn That Dream" from the 10" LP Lucy Ann Polk with The Dave Pell Octet (1953), one of two albums Lucy Ann released in her lifetime. Both are available together on the Fresh Sound CD compilaiton But Beautiful (2012). Lucy Ann Polk (pdf) is another fantastic lady jazz vocalist whose voice sounds like a super-purified version of Doris Day's. She is best known for being a big band vocalist for Les Brown in the early 1950’s. She recorded one 10" mini-album at that time, Lucy Ann Polk with The Dave Pell Octet, which fetches outrageous prices today. After this, she joined the ranks of small band lady jazz vocalists, releasing one lone album for the ill-fated Mode Records label entitled Lucky Lucy Ann (1957) that many jazz collectors consider to be one of the most perfect jazz albums ever recorded. Sadly, Lucy Ann passed away on October 10, 2011. Fresh Sound Records recently released a Lucy Ann Polk CD compilation entitled But Beautiful, which features both of her albums in their entirety, plus two bonus tracks. Julie London – The Ultimate Fan Site lives up to its claim of “assembl[ing] the best and most complete information on Julie London’s music, movies, photographs and articles, with links to other key web sites.” This incredibly loaded site features two discography pages; material covering her many film and TV appearances, including Quicktime videos of her Marlboro cigarettes commercials and her 1964 Japanese TV show The Julie London Show; and photo galleries galore, including one of Julie wearing opera gloves and a funny one called “PETA Hates Julie” (click to find out why). Pinky Winters' lovely rendition of "These Foolish Things," from the jazz collector's Holy Grail album Pinky (1954). Pinky Winters is a living jazz legend with an extremely active career as a lady jazz vocalist. She also joins Carole Creveling as one of vocal jazz’s most collectible artists, with her albums Pinky (Vantage Records, 1954) and Lonely One (Argo Records, 1958) being highly prized and expensive collectibles. Pinky left show business to raise a family, but returned in the early 1980’s, releasing the album Let’s Be Buddies in 1985. She has released another seven albums and counting in the last 20+ years, and regularly plays to appreciative audiences in Japan and in the USA, making her one of a handful of original jazz performers whose later career actually eclipsed her early career. Meet 1950's Cheesecake Singer Kathy Barr Written by This is Vintage Now producer David Gasten for the fantastic Nostalgia and Now blog, this article gives a full intro to the outrageously sensuous and over-the-top red-haired chanteuse that was Kathy Barr. The article features a link to a 1958 Armed Forces Radio interview with Kathy, a review of her debut album Follow Me (1957), a discography, and some other tidbits as well. One Shot Wonder Actresses The One Shot Wonder genre, featuring lady jazz and traditional pop vocalists who only released one (or sometimes two) full-length albums, is a fascinating alternative way to experience female vocal jazz and traditional pop. As you get into the One Shot Wonder genre, you will discover some performers that are better known as movie and TV actresses. In this article, we explore five famous movie actresses who only released one 12-inch LP apiece, and each album is great. You get to see and hear from Jane Russell, Diana Dors, Tina Louise (Ginger Grant on Gilligan's Island), Marie "The Body" McDonald, and Ilene Woods (the voice of Cinderella in Walt Disney's Cinderella) in this fun article. Hoy Hoy! Rock Before Elvis This fantastic site gets into the nitty gritty of Jump Blues and Boogie Woogie, featuring bios on the artists, samples of the music, and, best of all, a great essay called “The Dawn of Rock”, which answers the question of where Rock n’ Roll came from once and for all. With that mystery cleared, it’s now time for a little jump n’ jive, honky sax, and hoy-hoy! 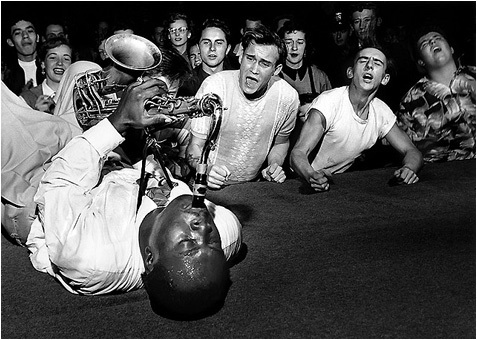 Big Jay McNeely Official Site is run by Big Jay’s Dutch management, Stichting Boogie Promotions, who also put on The Netherlands' International Boogie Woogie Festival, a well-established annual event that features many of the greats in the Jump Blues and Boogie Woogie genres. The site features a bio on Big Jay, photos of him from both back in the day and from recently, and other tidbits as well. Bull Moose Jackson is maybe best known today for the double entendre-filled song “Big Ten Inch Record”, which was covered by rock band Aerosmith on their Toys in the Attic (1975) album. We is also known for the song “Haul Off and Love Me,” which appeared on several 1990’s swing revival compilations. Bull Moose performed from the late 1940’s through the early 1960’s, when soul music began replacing Jump Blues as the black music of choice. He had a career revival in the 1980’s when an R&B revival group called The Flashcats worked with him as his backup band and also recorded with him in the studio. He passed away in 1989. This site, which I believe is run by ex-members of The Flashcats, offers a lot of unique information about this great performer from the Jump Blues era. The Space Age Pop Music Page "Space Age Pop" is another term coined for Space Age Bachelor Pad Music (also called "Bachelor Pad Music" for short). According to Joseph Lanza’s influential book Elevator Music: A Surreal History of Muzak, Easy-Listening, and Other Moodsong (1994; revised and expanded second edition, 2004), the full original term, "Space Age Bachelor Pad Music", was coined Hollywood special effects man Byron Werner (p. 124, first edition). This classic information site dates from 1999, so toward the end of the initial revival of interest in the genre. It contains a complete study of its many subgenres, and a massive Who’s Who List of the many artists who performed this type of music back in the day, including their biographies and discographies. Lots and lots of info here that will keep you reading. Bachelor Pad Music Facebook Page This Facebook Page was founded by This is Vintage Now producer David Gasten in 2010. Every Sunday we post many of the new Bachelor Pad Music podcasts that have gone up over the past week. We also post YouTube videos of great bachelor pad, orchestral, easy listening, and exotica artists, and as well as other related bric a brac about the artists of the genre as it comes up. A screenshot of the beautifully-designed official Henry Mancini website. Henry Mancini Official Site If someone does not know what Bachelor Pad Music is, just mention Henry Mancini's The Pink Panther or Breakfast at Tiffany’s and they will instantly have a reference point as to what it is. This fantastic-looking site run by Mancini’s surviving family features a discography, some fascinating video clips, a large photo gallery, and a letter of advice from Mancini to aspiring musicians. Lenny Dee at TheatreOrgans.com One of the great things about Bachelor Pad music is its extremely diverse instrumentation. Saxophones, brass, woodwinds, percussion instruments of literally all types, piano, vibes, harpsichord, and organ all get an opportunity to shine. Bachelor Pad Music’s most remembered organist was Lenny Dee, and this page features a bio on him, along with photos, memories about him from readers of the site, and more. Nelson Riddle's"Route 66 theme", which is of his best known songs. Read more about the song on Wikipedia's "Route 66" TV Series page. Nelson Riddle Music and Nelsonriddle.org Nelson Riddle was one of the top composers and bandleaders of the 1950's and 1960's. You've heard his conducting and arrangements behind Frank Sinatra, Rosemary Clooney, Ella Fitzgerald, Nat King Cole, and many, many others. Nelson Riddle's best known work within the Bachelor Pad Music genre is probably the "Route 66 Theme", with its free-wheeling piano and boistrous orchestral arrangements that capture the freedom of driving on the open road. Riddle's instrumental hi-fi albums, such as C'mon...Get Happy!, Love Tide, Sea of Dreams, and Love is a Game of Poker, have become bachelor pad favorites over the years. These two sites are run by Riddle's surviving family. The first one was built in the 2000's and is a great looking information site. The second one looks like a Wordpress site that was built more recently; this is the on that the family keeps current with news and anouncements. The two sites put together offer pictures of Riddle with many of the luminaries of his day, along with a whole lot of information about Riddle's albums and his long running career. "People Will Say We're In Love", a track from the great Bachelor Pad album Mmm, Nice! (1959) by Bob Thompson. That's Sandy Warner, cover model for fourteen of Martin Denny's Exotica albums, on the cover here. Bob Thompson Official Site Composer and arranger Bob Thompson is probably best known for the album Mmm, Nice! (1959), a highly recommended bachelor pad album that shows up in thrift stores in the States all the time, not because it was a bad album, but because the record company overestimated the demand and printed way too many of them. Mmm, Nice! catches Thompson melding the sensual and the stereo-testing together in a way that both 1950's hi-fi cats and their lady friends could enjoy equally. WFMU: Bob Thompson and The Sound of Style This is a really good blog entry in New Jersey-based community radio station WFMU’s “Beware of the Blog”, which documents a LOT of rare and forgotten music. This blog entry gives a full history on Bob Thompson and his career, and offers authorized downloads of rare Thompson material for you to download at will. Here is Exotica (1957), the Martin Denny album that gave the exotica genre its name, in its entirety. The entire album is a great first listen to the exotica genre. It features many of the genre's usual characteristcs, as well as a good selection of its "standards", such as the opening track "Quiet Village." And that's Sandy Warner on the cover once again. Exotica music is a style of 1950's music that is part of the Bachelor Pad Music/Space Age Pop umbrella. The music fuses together elements of jazz and classical music with sounds from exotic locales, in particular from Hawaii and Polynesia. Exotica became extremely popular in the late 1950's around the time that Hawaii became the 50th State in the United States. It became the soundtrack to a culture experience now referred to as Tiki Culture that has its own decorum, its own themed restaurants and clubs, and its own alcoholic beverages. This is a selection of existing sites dedicated to exotica music and its artists. Robert Drasnin Official Website Robert Drasnin was a composer who spent much of his life creating music for classic television shows like The Twilight Zone, Mission: Impossible, The Man From U.N.C.L.E., and Hawaii Five-0 to name a few. But his musical legacy rests on one exotica album entitled Voodoo that he recorded in late 1959 for the budget label Tops Records. Voodoo was intended by the record company as a cash-in record that capitalized on the exotica craze of the time, but the album itself was good enough that it ended up becoming a favorite with collectors and with tiki fans over the years. When tiki culture experienced a resurgence in the 1990's, Drasnin became a cult hero with tiki enthusiasts, to the point that he was able to release a follow-up LP in 2007 (48 years later!) entitled Voodoo II. Drasnin passed away in May 2015 at the age of 87, but his official website, built while he was still with us, remains as a memento of his legacy as one of exotica music's great artists. Les Baxter biography on Amazon.com Exotica as we know it today starts with a six-song album from 1947 entitled Music Out of the Moon. 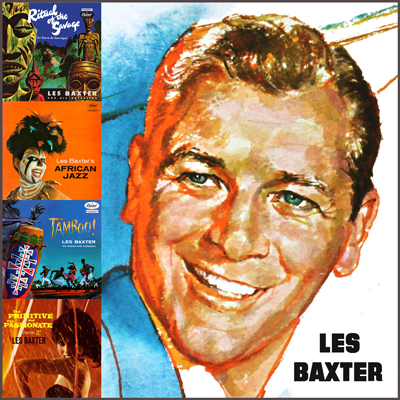 A composer/arranger with an insatiable taste for the unusual named Les Baxter was hired by Capitol Records to conduct this pioneering orchestral album that featured Theremin as lead instrument along with other-worldly arrangements. 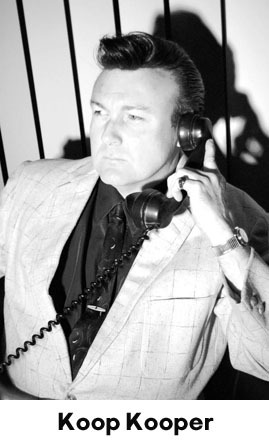 This was the beginning of a long period where Baxter would be one of Capitol's busiest and most successful arrangers, conducting radio hits like "Blue Tango" and "The Poor People of Paris", whilst also creating some of the most adventurous albums of the day, such as Ritual of The Savage, Tamboo!, and Yma Sumac's The Voice of Xtbay (Baxter was the conductor and arranger on that LP). This book, writen by pianist and Baxter protege Jim Spencer, retells the story of Baxter's life, from his poor beginnings in Texas, through his busy and prolific years working with Capitol and Reprise Records, to his work as house conductor/arranger for American International Pictures, and more. The book also features an indepth discography which is currently the best Les Baxter discography available. Yma Sumac Official Site and Sunvirgin.com (unofficial Yma Sumac site) The Queen of Exotica, Peru’s most famous entertainment export, and one of the most over-the-top singers to ever achieve international fame this side of Nina Hagen, the great Yma Sumac was still signing autographs and idolized by a devoted fan base right up to her death in 2008. These two sites feature many photos of the talented songstress, information galore, exclusive Yma memorabilia, and private-issue CD releases that are unavailable elsewhere. Note: Beware Sunvirgin.com's ridiculously expensive "limited edition" version of Yma's psychedelic album Miracles (1971) that is entitled Yma Rocks! There is an updated CD edition of this album with the original artwork and even more bonus tracks that you can get for less at Amazon.com. Ambient Exotica's Exotica Review Archive This is a treasure trove of album reviews that covers the majority of the exotica albums ever released. This archive has been my jump-off point for getting into the lesser-known classics of the genre, many of which were one-off projects that were never followed up on. Some of the exotica classics that the site covers include Ted Auletta's Exotica (1962), Frank Hunter's White Goddess (1959), Gene Rains Group alumnus Paul Conrad's Exotic Paradise (1963), and Richard Hayman's Voodoo! (1959). The archive includes reviews of more current exotica revival artists as well. I should point out that the webmaster uses the word "exotica" very loosely, to the point that all kinds of exotic-themed easy listening and even some 1970's disco-era albums get thrown into the mix. But it's still quite a fount of knowledge on the exotica genre and some of the other music around it. 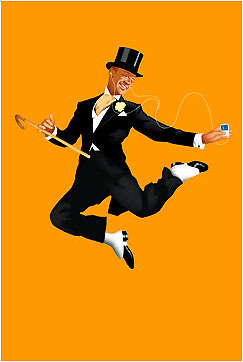 This clever image of Fred Astaire with an iPod was designed to promote Past Perfect Records' pre-loaded iPods and flash drives, which contain the entire Past Perfect catalogue on one convenient digital device. Past Perfect Records UK are leading the way in bringing the music of the 1920’s, 1930’s and 1940’s to today with outstanding mastering of the original recordings. The mastering processes they employ transcends the sonic limitations of the pre- hi-fi period and brings their sound quality up to current expectations. Many of Past Perfect's CD and digital releases are themed compilations featuring various artists, but they also have artist-specific compilations featuring names like Glenn Miller, Jimmy Lunceford, The Andrews Sisters, The Ink Spots, and Billie Holiday. If you’re not for sure where to start, check out their £9.97 sampler album; or, if you want to make the big plunge, check out their pre-loaded iPods and Flash Drives that have the whole Past Perfect catalogue pre-loaded onto them! Bear Family Records (Germany) have a long-running international reputation for releasing massive box sets that cover every facet of a Vintage artist’s catalog. For instance, they have a complete Sun Records Recordings for Jerry Lee Lewis, the complete Louis Jordan Decca recordings, and a series of Bill Haley, Dean Martin and Doris Day box sets that literally catch everything these artists have done in certain periods of their career, bar none. I’ve read so many reviews of these box sets that say, “Well, this is a little obsessive”, but to people who are mad about these artists and want everything, these outrageously well-researched box sets with impeccable sound quality are just what the doctor ordered. Fresh Sound Records (Spain) Good grief, where to even start with this label? Fresh Sound Records is becoming the go-to place for comprehensive jazz, traditional pop, bachelor pad, and easy listening reissues. They troll the vaults for scores of 1950's and 60's artists that collectors love, and present every last thing they can find in great "complete recordings" CD collections and 2-on-1 CD reissues. We've mentioned their reissues of Bob Thompson on RCA and the complete Luck Ann Polk recordings. There's also the must-have Beverly Kenney Decca Recordings and Beverly Kenney Royal Roost Recordings, and two astounding and well-priced Jeri Southern box sets (The Decca Recordings and the Capitol and Roulette Recordings) to check out. For great 2-on-1 records, you can't go wrong with Henry Mancini's Music from Mr. Lucky/Mr. Lucky Goes Latin, and there's a run of magical Jonah Jones albums with cheesecakey covers (dig the blue-themed A Touch of Blue with its over-the-top cover, paired with Great Instrumental Hits Styled by Jonah Jones). 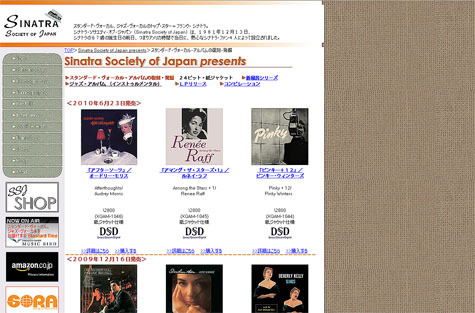 Screenshot of SSJ Records' official site. SSJ Records (Japan) (Japanese language site) are the good folks that released Carole Creveling’s Here Comes Carole Creveling (1955) and Beverly Kenney’s Snuggled On our Shoulder (2006) on mini-LP CD. They have released many more One-Shot Wonder and Vocal Jazz classics to fan excitement and critical acclaim, including the only album from South African late bloomer Renée Raff, and a compilation of rare recording appearances from Doris Drew. You can purchase SSJ titles from CD Banq, a fantastic Taiwan-based mail order house that specializes in exporting Japanese imports to the United States and the rest of the world. I've dealt with CD Banq personally and they offer fantastic service and fast shipping. See CD Banq's list of SSJ titles here. Eastwind Import (USA) is a California, USA-based importer that specializes in high-fidelity Japanese CD’s and high-end audio gear. They carry Beverly Kenney and Pinky Winters CD’s, many titles from the SSJ Records catalog, and other Japanese-import jazz and classical titles. For jazz fans in the United States, they are a good first place to check because their prices tend to be a little more reasonable. They also tend to be a little more selective about what they choose to stock, in part because of their focus on hi-fi customers. One of the classics in VSOP Records' catalogue is Delightful Doris Drew (1957), the only full-length LP by talented vocalist Doris Drew. Drew worked with big names like Mel Tormé and Les Paul, and even appeared as the singing voice of Alice in a 1960's Hanna-Barbera produced animated adaptation of Alice in Wonderland. There is a lot more greatness where this album came from in the VSOP catalogue. Bethlehem Records Interviews This page contains a brief bio and raw original research conducted by visual artist Tyler Alpern on the 1950’s jazz label Bethlehem Records. According to Alpern, “By trusting its staff and artists to make their own creative decisions, to experiment, and thus to flourish, Bethlehem actively helped create, not just document, a whole and diverse era of Jazz music.” Bethlehem Records' vast catalogue includes such names as Nina Simone, John Coltrane, Nat "King" Cole, Julie London, Art Blakeley, Duke Ellington, Chris Connor, Carmen McRae, Johnny Hartman, Helen Carr, Audrey Morris, and one-shot wonder Paula Castle to name just a few. One of the things that Bethlehem distinguished themselves with was with album covers that were true works of art—this is something that took on a life of its own in the hippy era and has pretty much been a given ever since, but was a relatively novel concept in the 1950’s. Burt Goldblatt, Bethlehem Records’ late album art designer, is interviewed in depth here about his album art for Bethlehem and about other album cover art that he did at the time. From George Shearing's MPS Records album The Way We Are (1974), this track is called "The World is a Ghetto". The track does not feel like a ghetto at all, but it is a good glimpse into the wildly beautiful alternate world that is the music on the MPS Records label. MPS Records (Germany) Jazz and easy listening went into a tragic decline in the mid-1960’s and 1970’s, and the artists in these genres found it harder and harder to get work as rock music skyrocketed in popularity. But there was a record label in Germany that became home to these displaced artists for a time. The label’s name was MPS Records, and listening to the music on this label is like entering an alternate world where jazz and easy listening music continue to stay great and evolve forward. Oscar Peterson, Ella Fitzgerald, George Shearing, Duke Ellington, Billy May, Lionel Hampton, and many others released albums with MPS, as well as contemporary (to the time) artists like Monty Alexander, Singers Unlimited, and The Third Wave―and that’s just the tip of the iceberg. MPS Records put out around 500 releases from 1968 through the early 1980’s. Unfortunately these releases have also become some of the consistently hardest to find albums in jazz and easy listening. But all that changed last year when the German record label Edel Records bought the MPS catalog from the mega-conglomerate Universal. Edel began releasing the entire MPS catalog on digital exclusively to iTunes in 2015, you can read more about this exciting set of reissues in this press announcement. 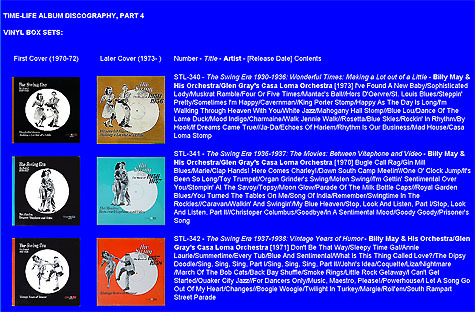 This is our very favourite page in the massive Both Sides Now Discography Archive: the page about Time-Life Records' best selling album series The Swing Era. This series of LP box sets features high-quality, high-fidelity rerecordings of popular songs from the 1930's-1950's, with a focus on Swing's late 1930's/early 1940's heyday. Both Sides Now Discography Archive Unbelievable. This discography site tells the stories of many of the record labels in recorded music’s history (from all genres), and has pages upon pages of listings of the albums released by each label, arranged in numerical order. Many of these pages are complete or nearly complete. This site is about as close to exhaustive as it gets. The Jazz Discography Project Features even more exhaustive info, but, as the name says, it largely focuses on jazz labels. Bethlehem, Blue Note, Contemporary, Fantasy, Impulse, Mercury, and Verve Records all get covered here. Discogs.com is a user-updated site that contains a discography info on thousands of artists, much of which is unavailable elsewhere. One word of warning is that the information in this site is far from complete, so always take their discography information on an artist with a grain of salt and check it against other sources. Koop Kooper’s Cocktail Nation on Podbean Koop Kooper’s Cocktail Nation is a weekly Lounge and Bachelor Pad Music Show run out of Sydney, Australia by swank Aussie cosmopolitan Koop Kooper. The show features a wide potpourri of music from then and now, and interviews the movers and shakers in the current lounge scene, as well as the veterans of the 1950's and 1960's who are still with us. Listening to Cocktail Nation regularly is a great way to keep up with what's happening in the world of Vintage culture. While you're listening, check out Koop's Cocktail Nation website, where he keeps a comprehensive World of Swank event guide, offers tips on the art of being hep, and more. The Buddies Lounge on Podomatic This Los Angeles-based show is hosted by Jason "The Big W" Scott, a longtime fan of traditional pop and bachelor pad music who collects music on vinyl, CD, and reel-to-reel. The Buddies Lounge has a very genuine sense of mid-century quality, authenticity, and class to it, to the point that the show sounds like it would have been right at home on AM radio sometime in the very early 1960's. The show features a who's who of classic music from the 1950's and 60's. They play a lot of the better known performers in vocal jazz and traditional pop such as Frank Sinatra, Dean Martin and Sammy Davis Jr., Steve Lawrence and Edie Gormé, Julie London, and Rosemary Clooney. They intersperse this with orchestral music from the likes of Henry Mancini, Percy Faith, Billy May, Si Zentner, Hugo Montenegro, etc. and throw in Latin artists like Perez Prado, lesser known favorites like Buddy Greco, Mavis Rivers, and Beverly Kenney, and exotica and bachelor pad numbers to boot. Also The Big W never speaks over the music; he's very good about staying out of the way and letting the music speak for itself. The Spin-O-Rama Hour on Podomatic This weekly vintage and retro show is compiled by Texas-based "Hostess with the Mostest" Esther. It casts a wide net over the music of the 1950's through early 1970's, covering everything from traditional pop to country western to rock n' roll to easy listening to MOR to Key of Z "outsider music" to soundtracks to exotica and more. It's an adventurous and well done show that keeps you wondering what you are going to hear next. The Tiki Cha Cha Club This weekly Portland-based broadcast has been playing on community radio station KBOO since 1998, and has a podcast presence on Podomatic as well. The Tiki Cha Cha Club loves to play up to the kitschy/quirky reputation that great lounge and bachelor pad music has had in the past. But like a fox running circles around its prey, prepare to be blindsided by some very deep, great quality cuts from host Joe "DJ Chintzy Schmalz" Woods' outrageously extensive vinyl library. With The Tiki Cha Cha Club, "Everything old Is new again, and you might grow nostalgic for a place you've never been to before." The Exotic Tiki Island Podcast with Tiki Brian only comes up intemittently (every one to two months), but it too is worth the wait. Each show is assembled as a journey to a fictional paradise island where you are both relaxed and entertained at the same time. Tiki Brian chooses from a wide selection of native Hawaiian music, WWII-era island themed music, and of course exotica and exotic-themed easy listening music. The show pulls from old-time radio, classic TV, and children's shows with its entertaining themes and its colorful cast of characters like Captain Scotty B and Grandpa Otto. The show also offers drink recipes, and enthusiastically plugs its donors and its sponsors, the latter of whom and are mostly local events, vintage clothing shops, or tiki themed mom and pop businesses. It's enough of a relaxing and joyous escape that it's honestly disappointing when the episode comes to an end. Listen to their archived episodes on their website, or find them in iTunes. The People vs. Dr. Chilldair is the blog of Los Angeles-based jazz historian Bill Reed, who provided us with the Beverly Kenney and Carole Creveling tracks that you hear on This is Vintage Now Vol. 1. Reed is the man behind many of the jazz reissue treasures put out by SSJ Records in Japan, and is maybe the prime evangelist in the world for the constantly fascinating One Shot Wonder genre of jazz and traditional pop vocalists. Reed posts about new SSJ releases he's worked on, and presents background info and original reserach on the artists. Reed also recounts his own stories or fun stories he's heard about the jazz artists of yesteryear. You'll learn a lot about jazz and related music of the 1950's and 1960's going through his posts. Retro Sonja Blog Sonja is an adorable ginger haired girl from Amsterdam who is truly a class act in every way. She constantly puts up photos of herself in new outfits she has acquired, and talks about her love for biking and about home life in her city. The blog is a pleasant, sedate experience, and Sonja's pictures just get cuter all the time. This is a gal who lives the life and is setting a pattern for future vintage models to follow. Vintage Clothing at Fashion-Era.com "Vintage" is a powerful buzz word in the world of fashion, but it's also one that is regularly abused because of its potency and innate promise of quality. 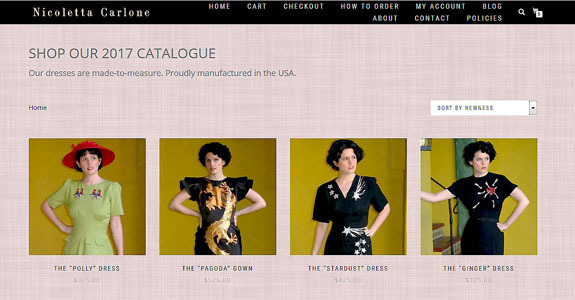 This site gives the best introduction I've yet seen to the world of Vintage fashion and fashion resale. It gives Vintage, Retro, Antique, and Collectible strict definitions, and gives would-be Vintage fashion entrepreneurs a down-to-earth and realistic idea of what to expect should they decide to start a Vintage resale business, complete with an in-depth run down of what fashion tended to be like in the different eras. Screenshot of Nicoletta Carlone's fashion line website. Nicoletta herself models the items in the line. Nicoletta Carlone Fashion Line Nicoletta Carlone is a clothing designer based in Los Angeles. She is married to entrepeneur and sometime film director Maxwell Demille, who owns the vintage music supper club The Cicada Club in Downtown Los Angeles. Nicoletta launched her own dress line in 2016, which features a plethora of clever and stylish designs. To make things even better, Nicoletta builds the pieces to last, and designs for a wide variety of body types. Read her About Page to get a sense of the care and love she puts into her pieces. Many of Nicoletta's dresses remind me of both the 1930s and the Film Noir period, with some featuring Addams Family-esque touches like spider webs and stabbed hearts. Others use contrasting colors and exaggerated features that are sure to turn heads and elicit comliments. The Art of Manliness Blog Founded in 2008 at a time when the messy haired 7-year-old boy look was all the rage and when Western society was maybe at its most man-hating, this blog sought to restore a sense of confidence, adult responsibility, and pride in adult males by examining the many aspects of what it means to be a man, and by providing them with the skills and knowledge to achieve it. As the site says in their About Us page, "We explore all things manly — from the serious and philosophical to the practical and fun." Since this page was founded, we have seen something of a subtle movement back to an appreciation of men and manliness on an underground level. And from everything we can tell, the current obsession with moustaches, beards, and Edwardian bric a brac seems to have at least some of its roots in this very blog. It looks like The Art of Manliness blog will be with us for a while to come, demonstrating for both genders what being a strong, responsible, brave, kind, loveable, cultured gentleman looks like. The Velveteen Lounge Kitsch-en on YouTube This brilliant, one-of-a-kind YouTube series is hosted by New York-based actress and culimary mistress Kelly Patterson and her husband Paul Spencer. Every week, this show offers easy-to-make food and drink recipes in a delightful and willfully kitschy style, underscored with subtle humor that loves to catch you when you least expect it. We've already sung the praises of this series is in our article Genius in the Kitsch-en, which discusses the series as a whole but in particular examines the brilliance of their most popular video, "Lime Jell-O Marshmallow Cottage Cheese Surprise." Humor is the most difficult art of them all, and this series has it mastered. 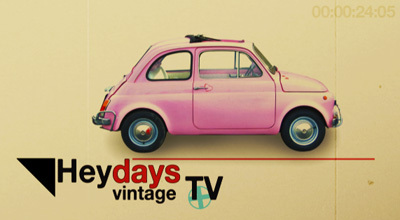 Heydays Vintage TV This upcoming East Coast-based show is the brainchild of Washington, DC-based producer Nico Belha and her husband Juan Carlos Diaz. Nico is a former news reporter who has found much to love in the vintage and retro periods, and will be covering both in this show. There is a brief HD teaser trailer for the show that you can watch on Vimeo. Be sure to visit their beautifully-designed website as well. Vintage America With Ginger on Facebook This stylized Los Angeles-based TV series is hosted by entertainer Ginger Pauley, whose jazz band Ginger and the Hoosier Daddies we covered at the very beginning of this list. Vintage America with Ginger does not disappoint; the pacing is perfect, the visuals are sumptuous and atmospheric, and the content and presentation is straight up timeless. Not to mention, Ginger is a charming and brilliant hostess. Ginger is paying careful attention to bringing back the spirit of the period, with a mind for educating others on the culture of yesteryear. As Ginger told us recently, "We don't just show you the popularity of the Vintage movement, we also show you how you can live it!!" The lounge area in The Tonga Hut in North Hollywood, CA. Founded in 1958, The Tonga Hut is the longest continuously running tiki tar in the Los Angeles area. Photo courtesy Wohno Frank Lee and originally featured in this la.eater.com article. The Seventeen Best Tiki Bars in America This is a good overview of the variety and color that tiki bars throughout the United States have to offer. This list covers a lot of ground, from original Los Angeles tiki era holdover Tiki Ti, to San Francisco's hidden Smuggler's Cove, to an estalishment with swimming mermaids in—of all places—Great Falls, Montana. Although tiki culture has had a resurgeance dating back to the 1990's, the last few years has seen the phenomenon really kick into gear with the opening of even more tiki establishments, so we look forward to seeing lists like this get even more comprehensive in the coming years. The Tonga Hut Located in North Hollywood and founded in 1958, The Tonga Hut is the oldest and longest consistently running Tiki bar in the Los Angeles area. This is my favorite place to take visitors who come to Los Angeles from out of town. Walking into the bar is like finding the proverbial trapdoor that suddenly whisks you into a different world; you really feel like you just went back in time. 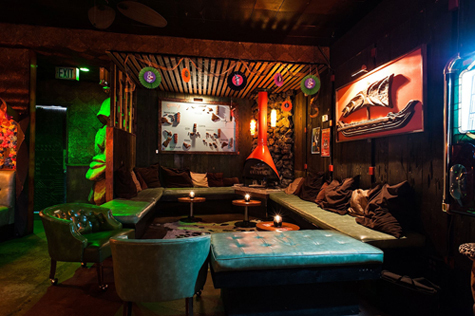 The club has small waterfalls, a primitive but cozy lounge area, booths with awnings over them, and a collection of tiki decorum and memorabilia that is a nostalgia trip all unto itself. In 2013 they opened a new location in Palm Springs as well, so great to see them having so much success. 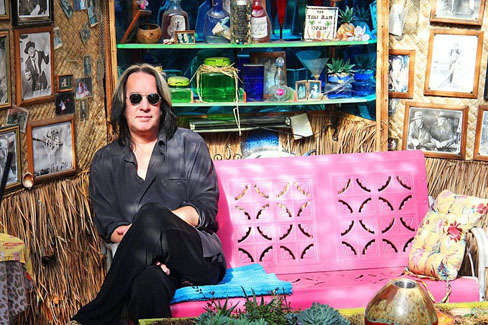 Entrepreneur Todd Rundgren relaxing amongst the décor found at Tiki Iniki, the new Princeville, Hawaii-based tiki nightlife establishment co-founded by he and his wife Michelle. Tiki Iniki February 2013 saw the start of a new Exotica and Tiki-themed nightclub based in Princeville, Hawaii and run by entrepreneurs Todd and Michelle Rundgren. Michelle is best known as a comedienne and as former dancing girl in the rock band The Tubes, and Todd is the prolific veteran rock musician and producer. This new nightlife establishment is largely Michelle's brainchild, and goes out of its way to pull out all the stops in delivering a top-notch tiki experience. Here's what Michelle has to say about it: "Tiki Iniki...is an exotic place for crafted Tiki Cocktails, Island Cuisine, Live Entertainment, and Dancing. The decor is Vintage Tiki, Hawaiiana, and Exotica from the 1940's to modern day. The staff of sultry sirens and savage mixologists add to the ambiance." From the looks of things, it seems like things are going great for them! Don the Beachcomber Restaurant Tiki Culture has its origins with Don the Beachcomber (born Ernest Raymond Beaumont Gantt), a native Texan turned world traveler who began the legendary Don the Beachcomber Restaurant in Hollywood in the 1930’s. The restaurant offered an escapist atmosphere that would soon become a favorite haunt for celebrities, and which laid the groundwork for the Tiki culture craze of the 1950’s and beyond. Don the Beachcomber’s restaurants became a successful chain under the guiding hand of his wife Sunny Sund in the 1940’s while Don served in World War II, and the chain continued on well into the 1980’s. The current Don the Beachcomber restaurant is located at 16278 Pacific Coast Highway in Huntington Beach, California, where it has been since 1969. Arthur Snyder bought out the Don the Beachcomber brand in 2007, and continues to preserve the lush atmosphere, the careful mixologies, and the one-of-a-kind dining experience that has been a Don the Beachcomber tradition for nearly seven decades. Written by This is Vintage Now producer David Gasten at the height of the burlesque craze, this article pretty much says it all. That was “Vintage” then. This is Vintage Now!